I just have to say that all of you are some of the sweetest people I have ever encountered. All your sweet comments about my broken arm are permanently embedded in my heart! You mean so much to me and the friendships I have developed through blogging are a treasure to me. If I could, I would write every single one of you a special note, but all this typing with my left hand takes a bit of time so I am thanking you in this post. I love you and I am so thankful to have you in my life. I truly believe the blogging community is one of the most supportive and encouraging. I so appreciate you. Just so you know, I keep falling asleep as I type this. Too funny. So the arm. Yesterday I had surgery to put a metal plate in (kind of like a bracket) to hold the bone in place. This helps it to heal faster too. They were hoping not to go that route but this was a pretty bad break and the only solution. It went great and now I'm officially on the mend. Last night was a little tough with all the pain but I woke up feeling pretty good. I'm trying to only take pain medication as needed because it makes me so loopy and sleepy. My Ella climbed into bed with me last night and held my good arm like a teddy bear the entire time which is so unlike her.It was so precious...it reminded me that these innocent little hearts need reassuring that their Mommy is ok and they still need some snuggles and hugs so that all is right with their world. And my incredible, gentle, and sweet husband is taking such good care of me and there is no on else who could give me better care. I love and appreciate him. And wasn't his post just the cutest? Happy, Happy New Year Sweet And Dear Friends!!! So I broke my arm today. And believe it or not, that in itself is a blessing. Here's the story in a nutshell. I was putting Christmas decorations away. We store them in our attic which is above the garage. From the high peaks in our house, there is a nice tall walkway down the middle of the attic. However, in the middle of that is a 2' x 2' foot hole, which for some reason is missing plywood to walk on (who knows why) where you do not want to step. I must have forgotten that important point along the way because while putting boxes away I stepped in that spot, busted through the drywall and fell 10 feet to the cement floor of my garage. (note, the shade of blue...aka Brandon her husband... in the house is typing this, and getting a little queasy as he does, but not like she can type right now. Although even with one hand and pain killers she could do a better job than me). Somehow, only my arm was broken, no damage to my elbow or shoulder, no damage to my ribs nor did I hit my head. The hand of God truly was around me as I took that fall. This could have been so much worse. Now I lay in my bed, arm in a splint planning on going to an orthopedic specialist in the morning. Chances are they will do surgery to put a plate in to aid the healing of my arm. But for now, I imagine the crafts will have to take a back seat as I heal, rest and promise my hubby that I never, never ever go up there again. Please keep my beautiful wife in your prayers. Well hey there sweet friends! I am hoping you had an amazing Christmas and enjoyed every memory making moment. Ours was absolutely lovely until sickness fell over all of us. I have completely lost my voice! But I still have my blog voice so I still can write! Woo Hoo! I am on a creative hiatus at the moment. To be honest, I am enjoying just being a mom and a wife. Keeping house. Photographing the girls instead of pretty things (though they are 2 of the prettiest things I have ever seen ♥). 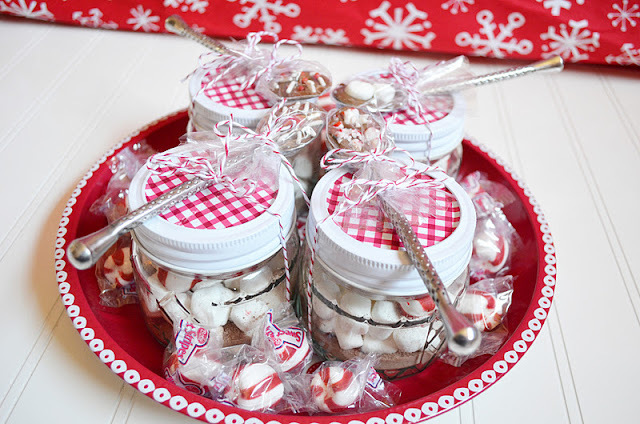 In the meantime, since I am contracted each holiday to make cute favors, I thought I would share another one I did for New Years. 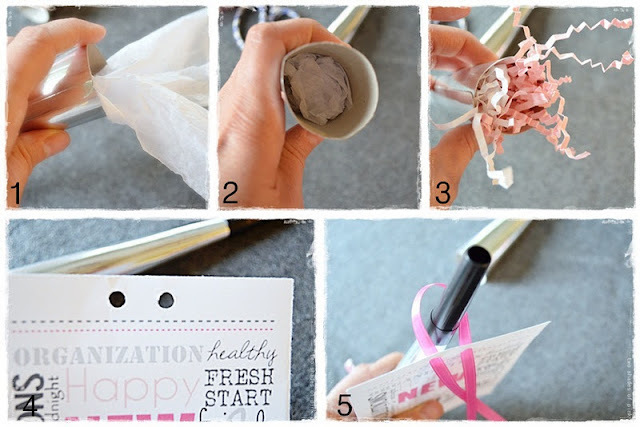 I ordered a bulk amount of silver party horns and decided to make a little mini subway art styled card to attach to each one with some pink ribbon. For those I used Avery's printable post cards. I'm not even sure I did the subway art correctly...I kind of crammed some phrases together until I liked it. :) But it turned out cute so that's all that matters. I have to send all these favors all over the country so obviously they need to be mailed. 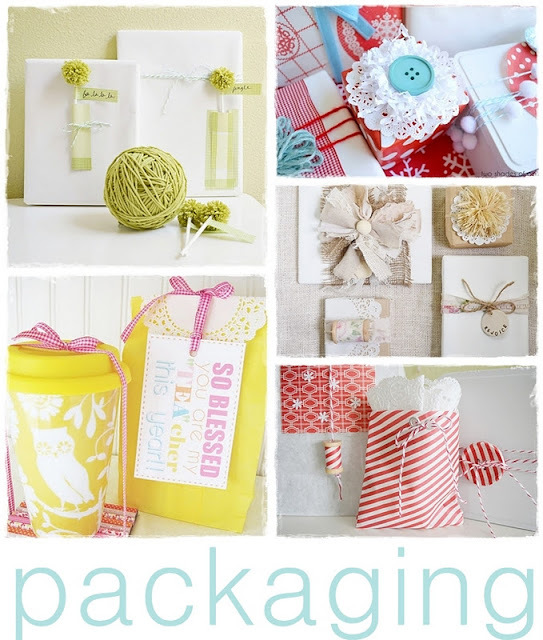 I am always challenged to come up with a cost effective way to make and ship these favorss. To avoid being crushed, I filled the inside with filler. 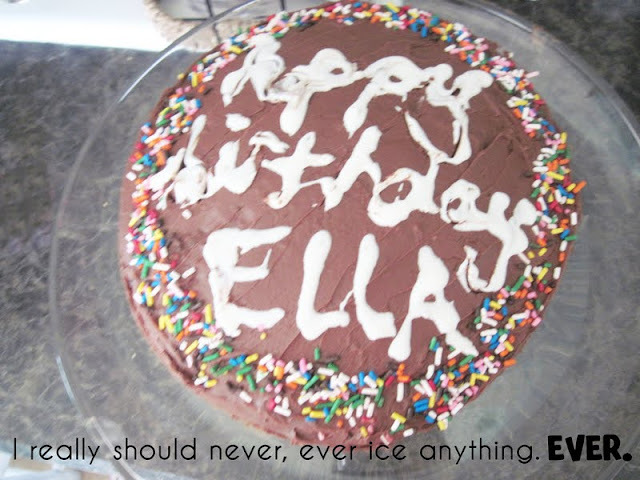 In case you like this idea to send to people, I included what I did. 1. I cut strips of tissue paper and stuffed them all the way in to the bottom. 3. 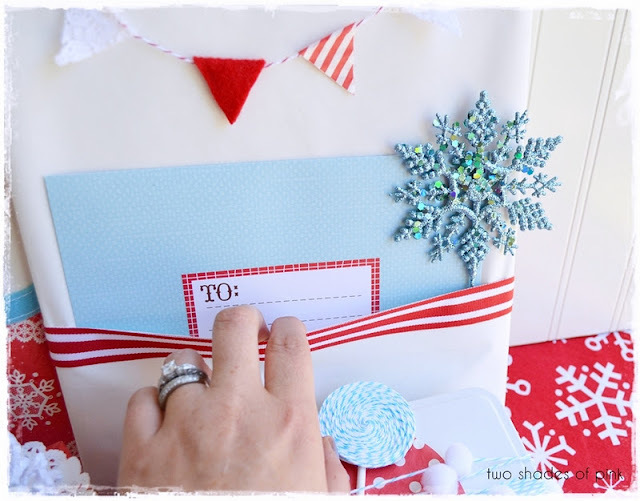 The ends are pink crinkle filler paper for a little festive look. 4. 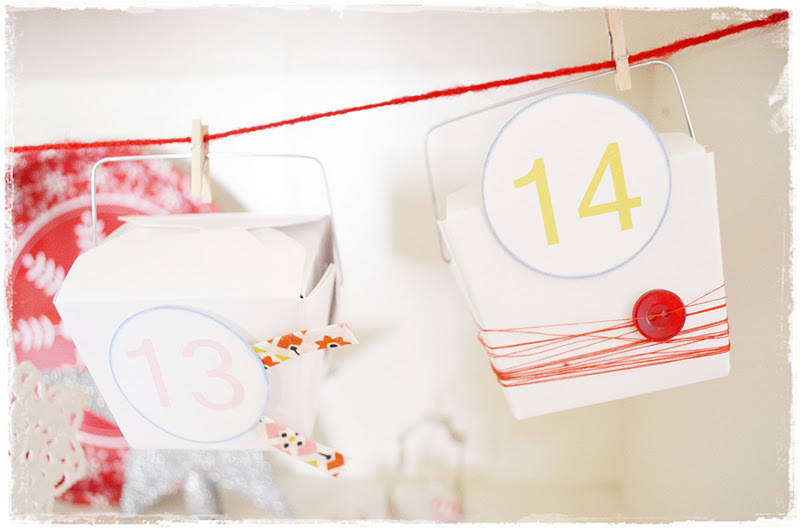 Using a hole punch, i made two holes at the top for the ribbon. 5. I attached the card to the horn with a little bow. 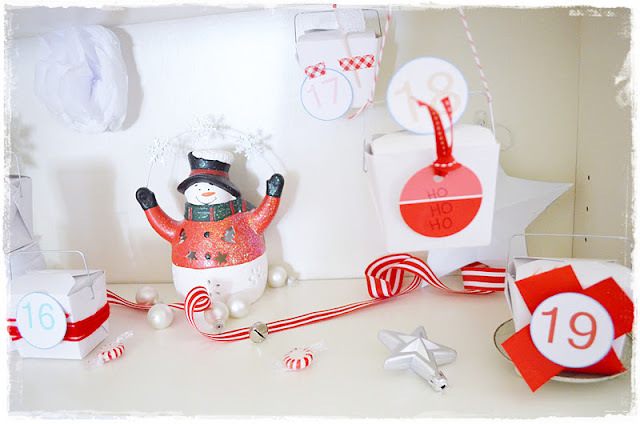 So simple and a super fun way to wish a happy new year. 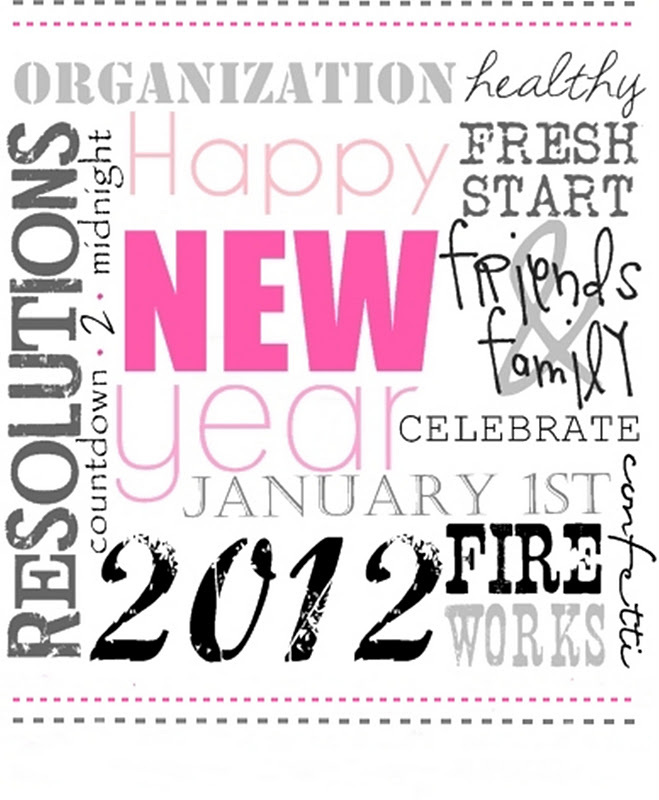 Or even a fun birthday or New Years party invitation. They also would make great New Year party favors too (shown in top photo) as the countdown to midnight approaches. Grab it, print it, use it! 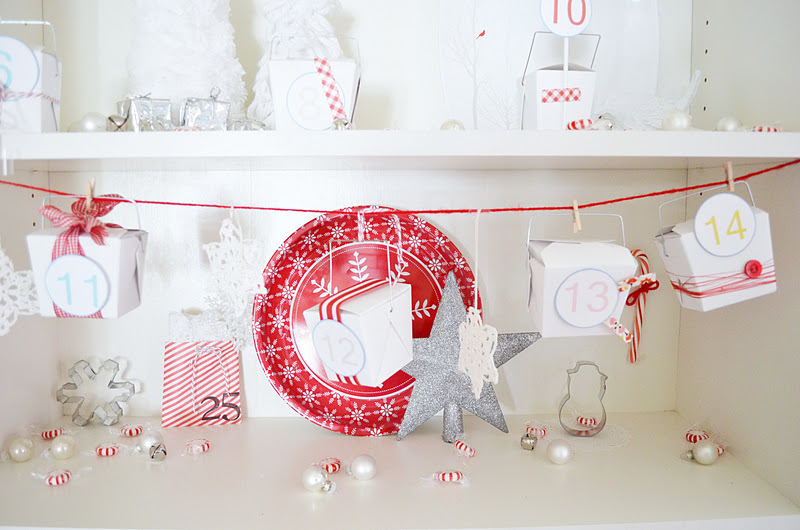 Oh, and soon I will be taking down my bloggy Christmas decorations and going back to normal. It feels like it all went by so fast! 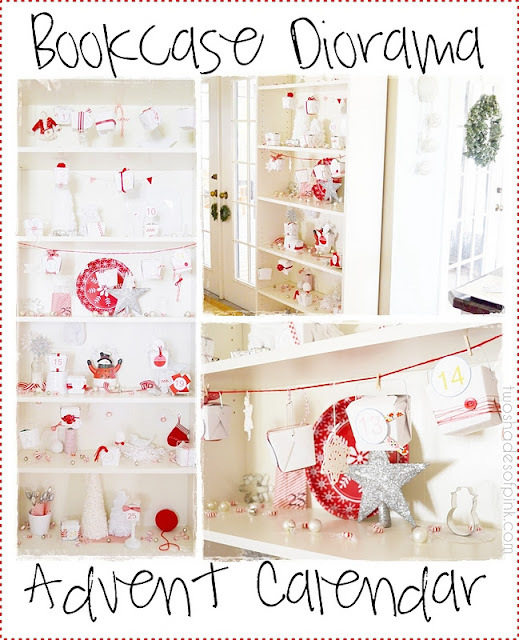 Hopefully the New year will bring more fun ideas and tutorials to share with you. 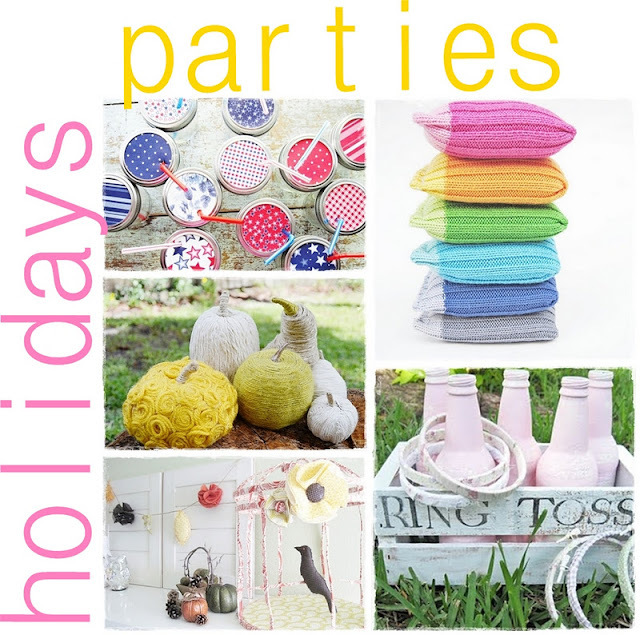 And I may be adding a linky party to the crafty sea of linky parties! We are in the home stretch now! 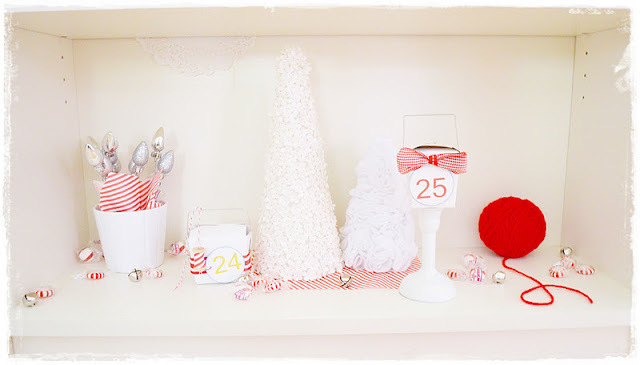 It is UNBELIEVABLE to me that Christmas is 4 days away! Maybe because it is 80 degrees here? It just seemed fast this year. Really fast. 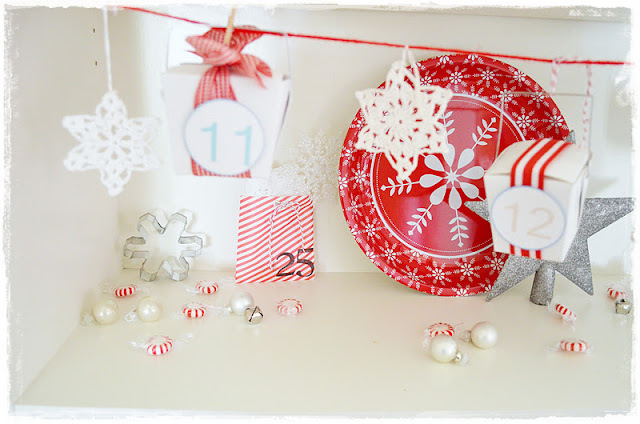 So I think this is my last post until after Christmas. Gotta snuggle with those littles and my youngest has a fever today :( but is the happiest sick kid in the universe. I could just squeeze the stuffing out of her she is so sweet. 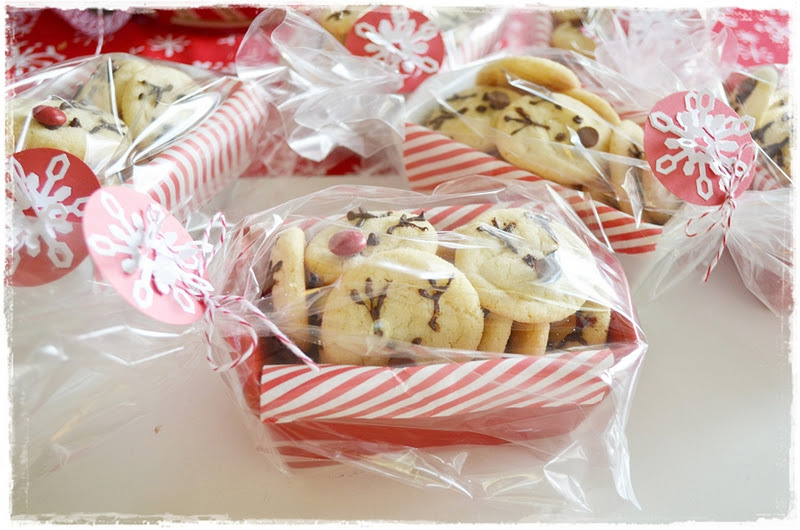 But in the meantime, let me share the little treats I made for my neighbors. 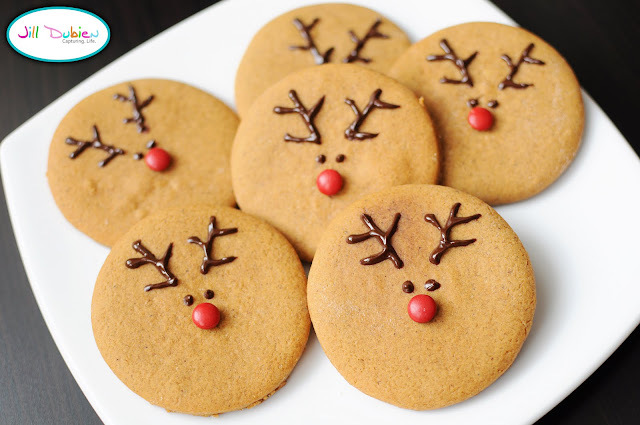 I have to give COMPLETE AND TOTAL PROPS to Jill of Meet the Dubiens and her adorable reindeer cookies above. 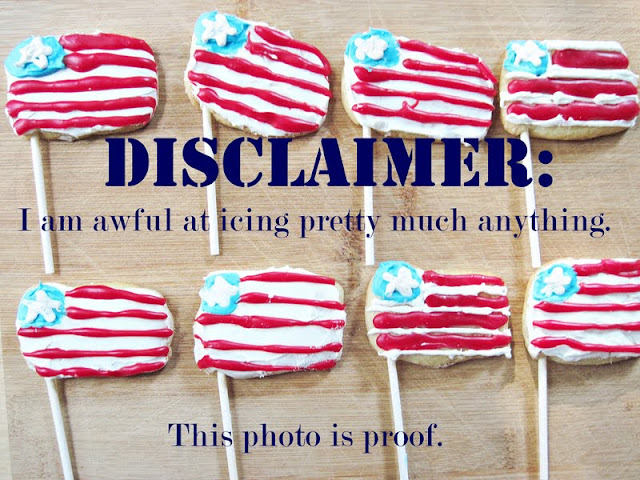 My 4th of July cookie flags. I am truly challenged and should be stopped if ever spotted wielding a pastry bag. 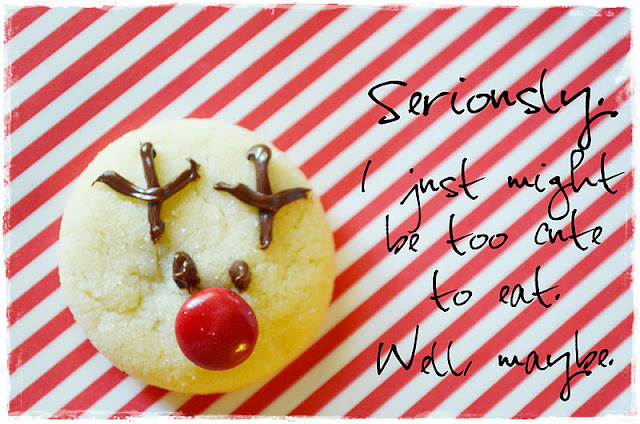 But when I saw those, cutie patootie reindeer, I figured those were pretty easy. It was one of the first things I pinned on Pinterest. Some antlers, 2 eyes and plop a nose on there. EASY PEASY! They certainly don't look like Jill's but I think they are cute enough to give to my neighbors and still show my face in my hood. I decided I would give each neighbor a dozen reindeer cookies. I had bought those cute little ceramic mini loaf pans at Michael's for a $1 each. 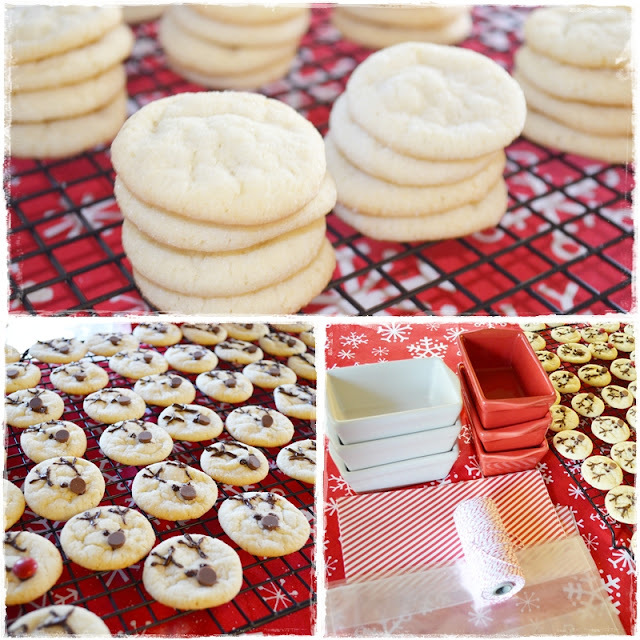 Jill made her cutie gingerbread cookies but I made sugar cookies. I decided to make 11 with brown noses (chocolate chips) and 1 with a little Rudolph nose (a red M & M) as a little giftable treat. Too cute! Whisk flour, baking soda, baking powder, and salt together. Set aside. Beat together sugar and butter until creamy. Add egg and extract. Mix well. Add dry ingredients a little at a time. Roll the dough into little balls and then roll into sugar placing them on parchment covered baking sheets about 2 inches apart. Make 8-10 minutes until edges are slightly browned. Cool on baking sheet for 2 minutes and then transfer to cooling rack. And I think they turned out pretty adorable. 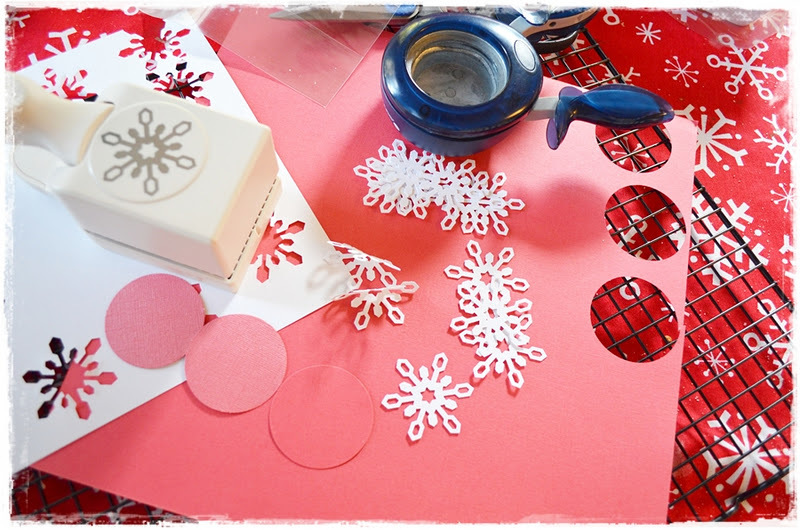 I made the tags with a 2 inch circle punch and Martha's snowflake punch that I found at Marshall's for $4.99. Marshall's and crafty goodies on the cheap? Who knew? 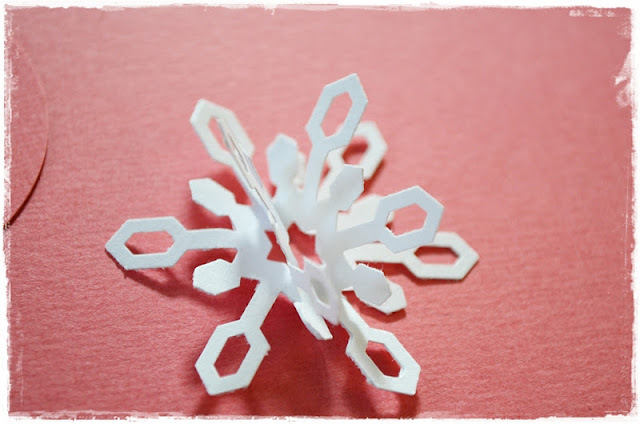 I wanted the snowflakes to be 3 dimensional so I folded one so the edges would be bent and glued it to the middle of another snowflake. My message was on the back of each circle. 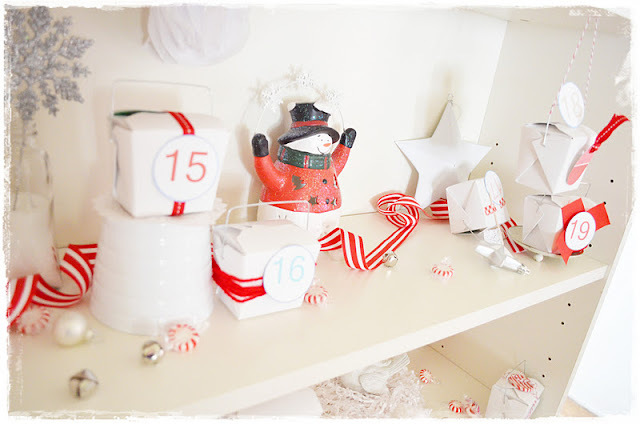 I slid each one into a cellophane bag, tied it off with twine and the tag and that's it! Another idea I had is to use a plate from the dollar store and a ceramic pen. Another great way to gift some cookies. 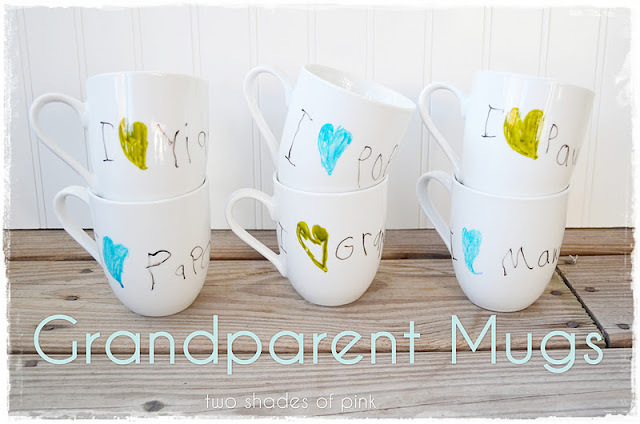 You could also use the pen on those ceramic loaf pans too but I just did not have the time this week. I wrote around the perimeter of my plate with parts of Christmas songs, favorite things I love about Christmas, traditions etc. 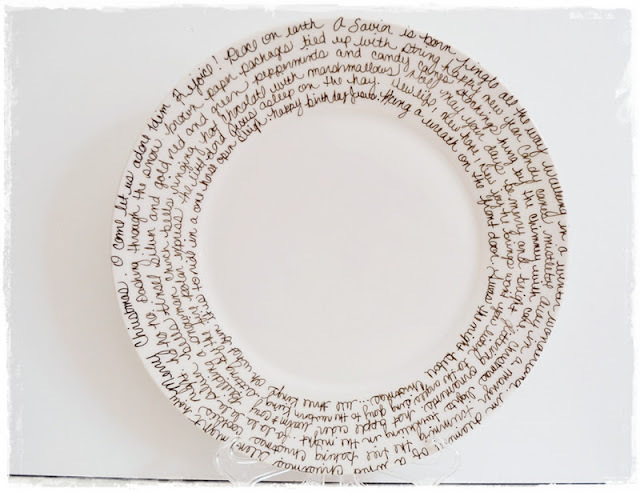 I am not crazy about my handwriting but the finished plate looks really cute and I like the simplicity of the wording in black. 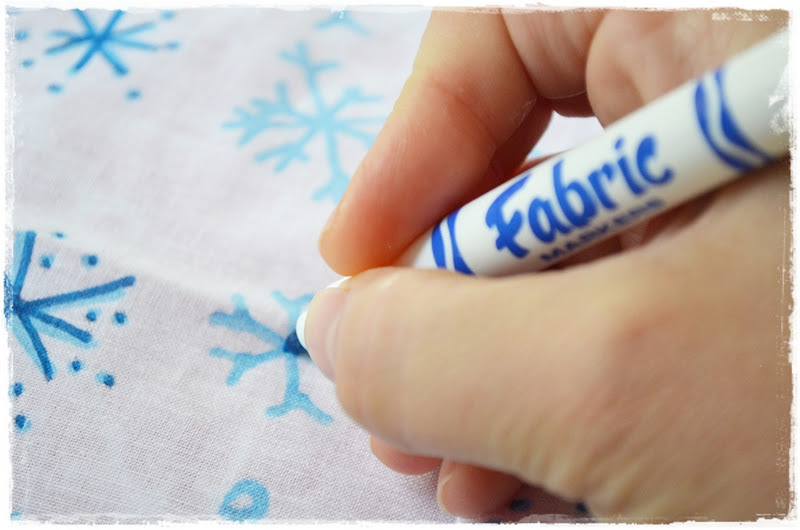 I bought two 99¢ solid color bandannas in red and white and used a fabric marker to draw snowflakes all over the white one which was super fun to just doodle for 30 minutes. 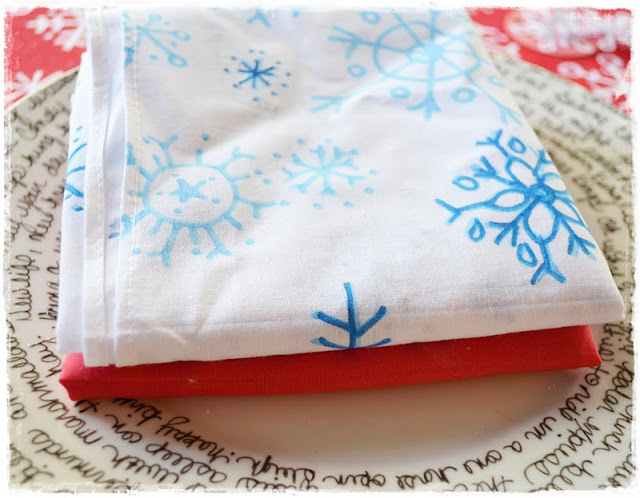 Then using my idea here, I wrapped the cookie plate with the bandanna and tied it off with a cute little snowflake embellishment. 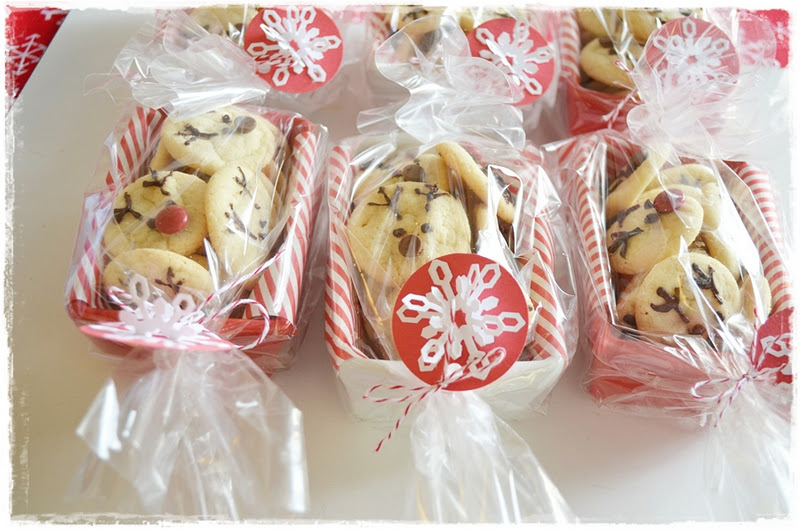 A great way to travel with a plate of cookies, pie, etc for the holidays. Knowing many of you, your neighbor gifts are already done but I thought I would still share. Hey sweet people! I wanted to share this post of blue and red packaging ideas I did last week over at The Shabby Creek Cottage. 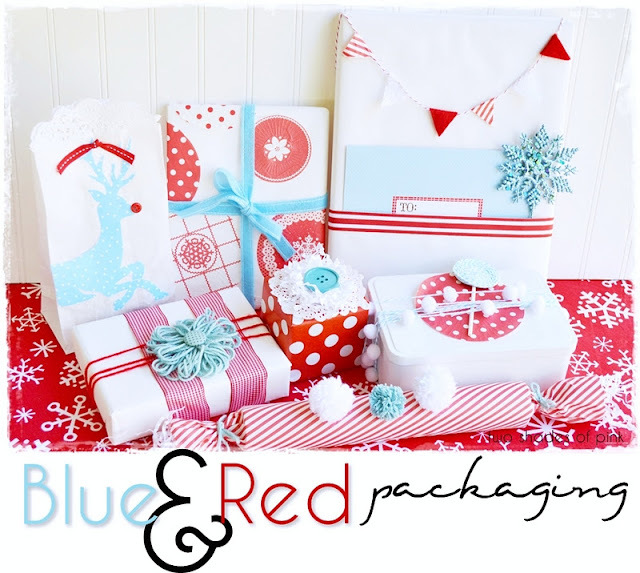 I wanted to repost it for you before Christmas got here and you had everything wrapped already! I am for reals just getting in the door (time check: 12:21 am) from Christmas shopping. Wow. I am the most last minute ever...I think I broke a personal record for procrastination. So I figured, I am up...let me post those packaging ideas. And I think this may be the last one of the season. I am almost sad. 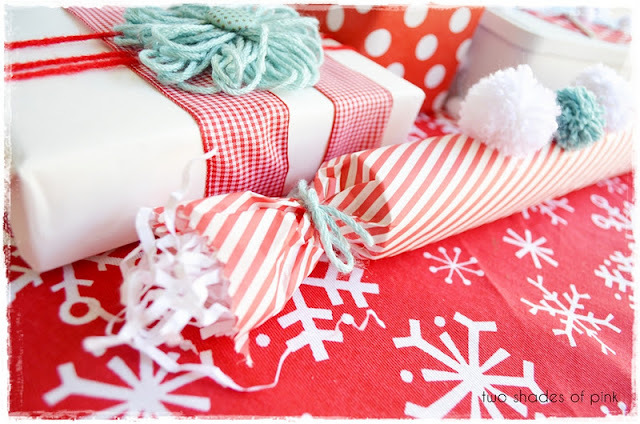 I still might have some gift ideas to share but wondering if I will have time to blog about them. We shall see. I also wanted to apologize for not visiting and writing to a lot of you! I always like to reply to comments but I also want to see my children too. :) So know that after the holidays I should be back to my old blogging self, peeking in on you and saying hello with my emails. First up is one of my all time craft loves...yarn. I love working with it and you know what? I don't knit or crochet even a little bit. But I wish I did. 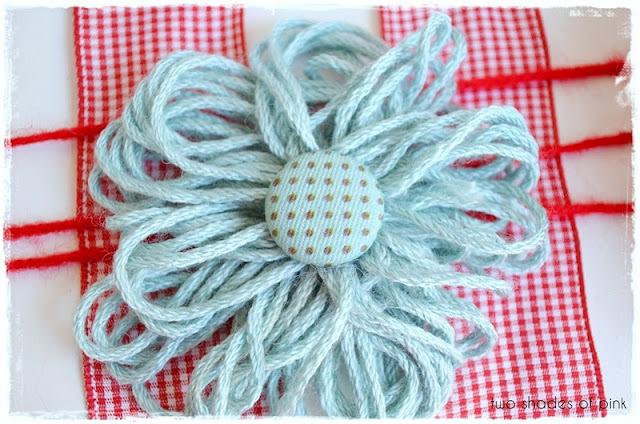 This happy yarn flower is made just like a pom pom but you don't give it a haircut. Just wrap the yarn around spread fingers about 30 times. Slide the wrapped yarn off your fingers and tie a knot around the middle. Then kind of fluff out the loops and hot glue a fabric button to the center. 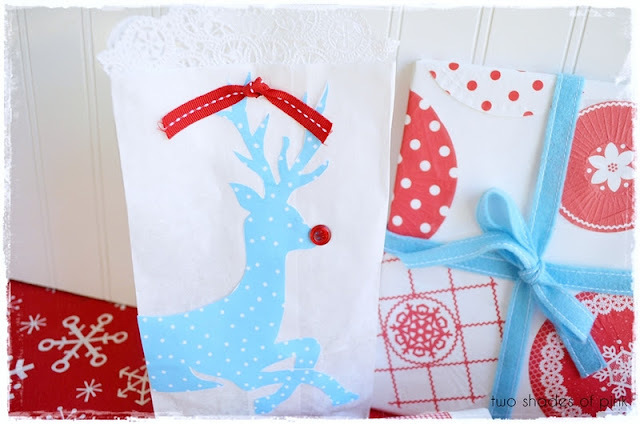 How much do I adore this Rudolph-esqe Bag? I guess it depicts Rudolph all grown up after the bullying and problem years. I found some clip art I liked and using image editing software, I made the image a silhouette, played with the color balance and saturation (I liked this color blue), and added tiny little polka dots. I then sized, printed and cut it out and glued it to a simple white bag. Since I don't have a fancy schmancy cutting machine (I hope, I hope, I hope it will be under the tree), I went old school. Scissors. I am talking scissors, friends. You can even print out the image on your bag. Just set your printer to the bags dimensions and print. My cheapo printer won't let me. Boo. To embellish, I used a red button for the nose and tied the top closed with some red ribbon. The doily is used as a filler and when punching a hole in the bag, I punched the bag and doily together and threaded the ribbon through both to keep the doily from sliding inside the bag. 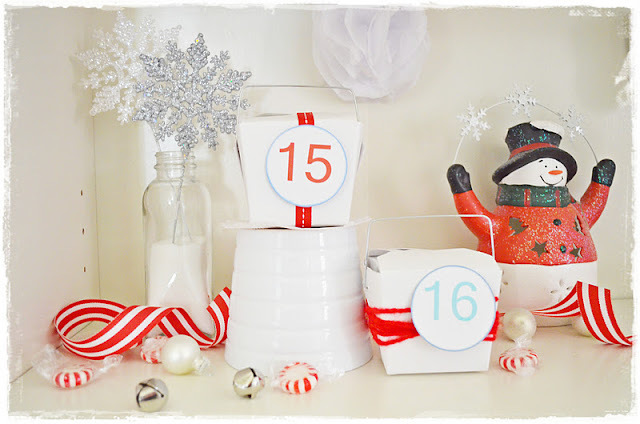 Perfect for reindeer feed or fun little snacks. I think this one is my favorite. 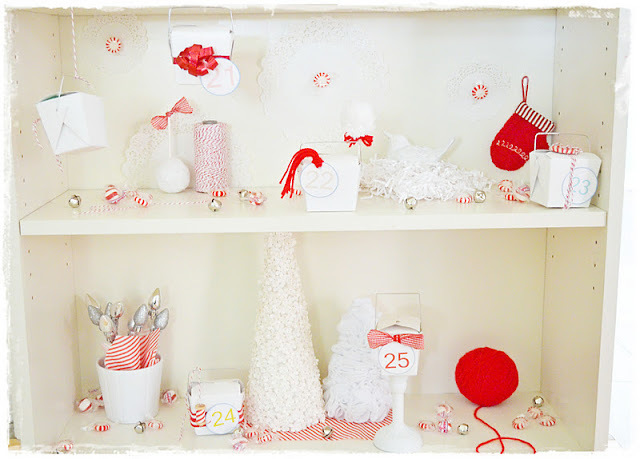 I covered this one with red and white cupcake liners using a glue stick. EASY PEASY! To flatten them, I used a warm iron and spritzed them with water to prevent burning them. 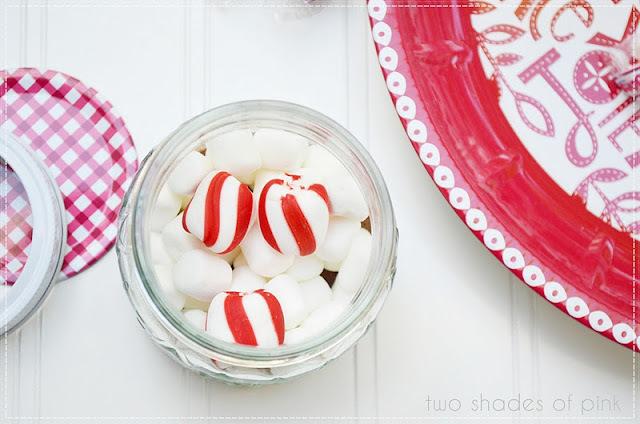 I love how they are randomly placed to look like big, fancy polka dots! The tie is a blue, felt ribbon. 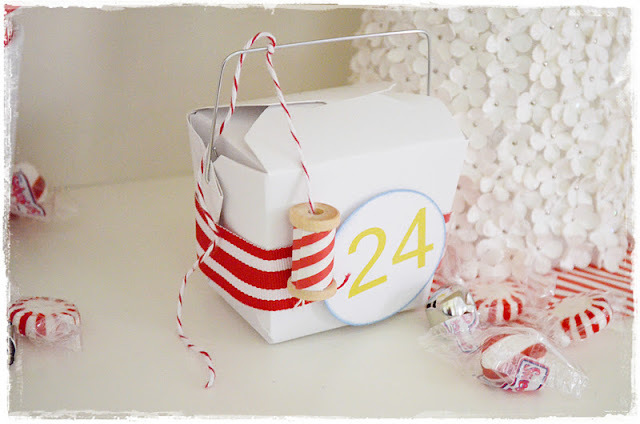 I love the whimsy of this white spray painted cookie tin. Here, I used a cupcake liner again in the center. 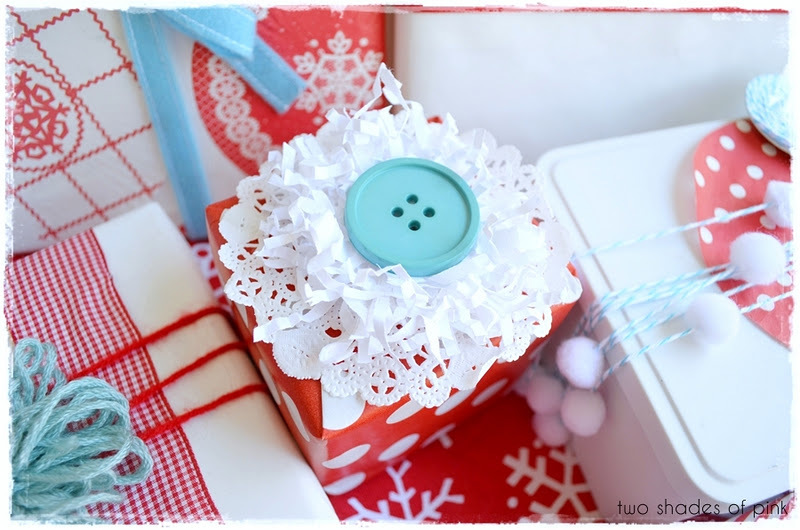 It is wrapped with a pom pom tie using blue baker's twine that was needle threaded with mini pom poms. The lollipop is made from the blue twine as well. 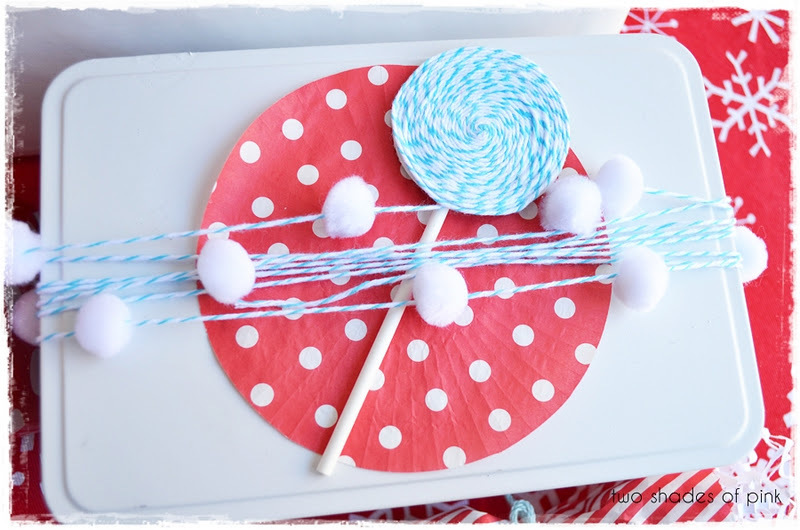 To make the lollipop, I cut a 2 inch circle from card stock with a paper punch and spiraled the twine from the center while securing it with glue. After it dried, I glued the circle to an actual lollipop stick. This cutie topper is made from shredded paper filler! Again, I used a 2 inch circle of card stock as the base. I attached double sided tape and in a sunburst formation, began attaching the strips of paper to form a circle. Once full, I trimmed it, glued it to a 4 inch doily and topped it off with a button. 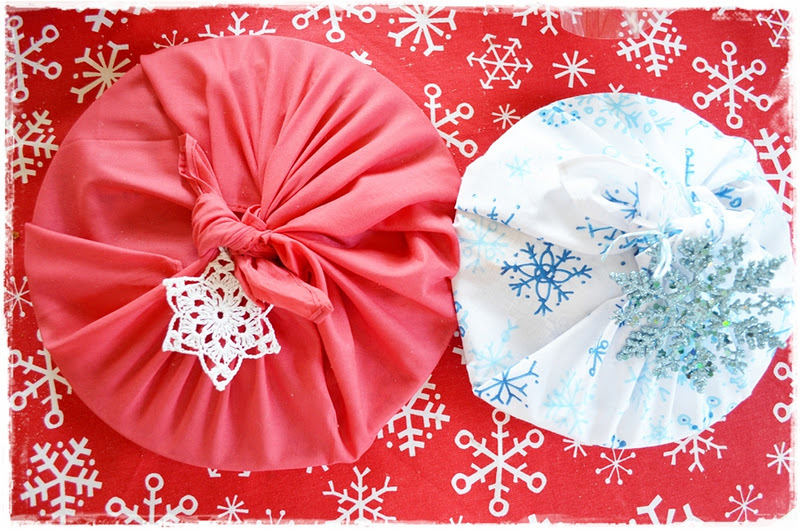 I have a thing for pockets and putting them on a gift is a little unexpected but oh so fun! It is perfect for shirt boxes. I wrapped an extra piece of wrapping paper around the box while folding it in half to strengthen it. Using double sided tape, I attached a ribbon to the top of the pocket. 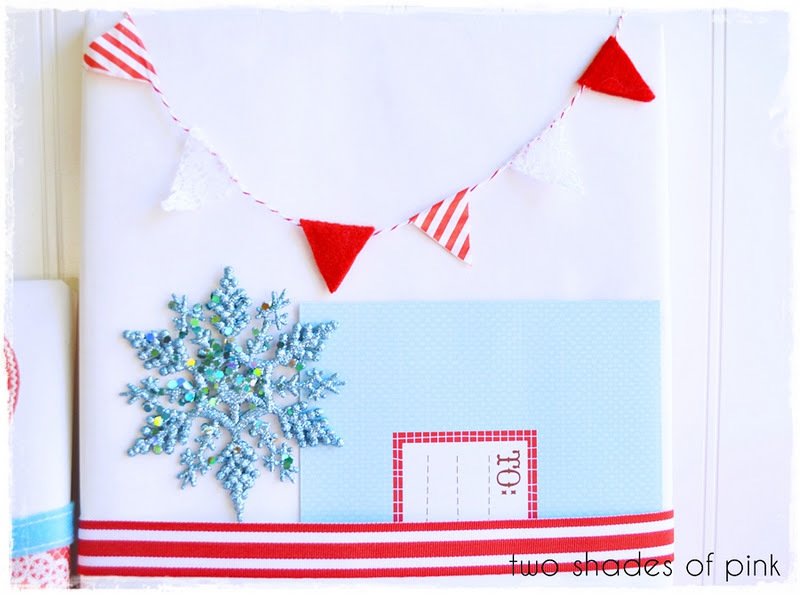 The pocket is great for cards or other embellishments like this sparkly snowflake. 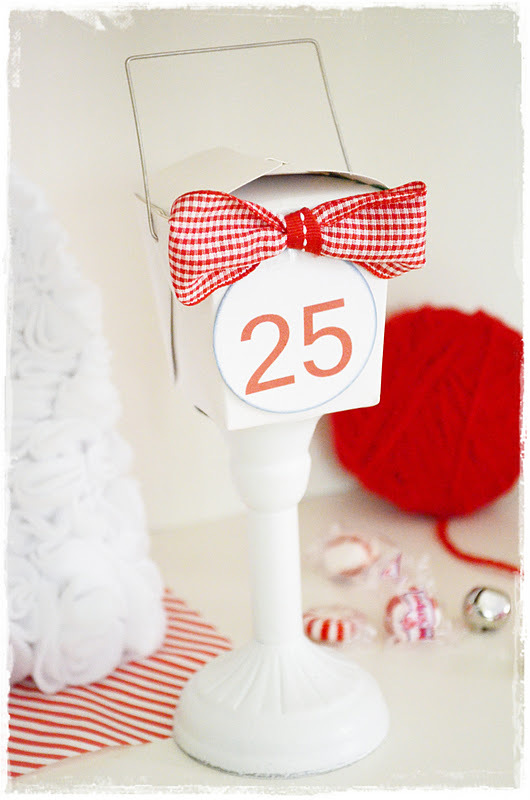 The festive, mini bunting wrapped around the top is made from baker's twine, red felt, craft lace, and tissue paper. I showed this to you before but not on an actual package. A perfect finish! Merry Christmas and Happy Hugs my friends! This almost NEVER happens...me posting on a Saturday. But my daughter just got finished with these ridiculously cute mugs for our 3 sets of Grandparents and I HAD to share them with you. I wanted to share a quick and easy holiday cutie project perfect for the kids, parties, neighbor gifts, teachers, or just some family fun! If you did not already know, I happen to have this "thing" for mason jars...even before they became trendy. 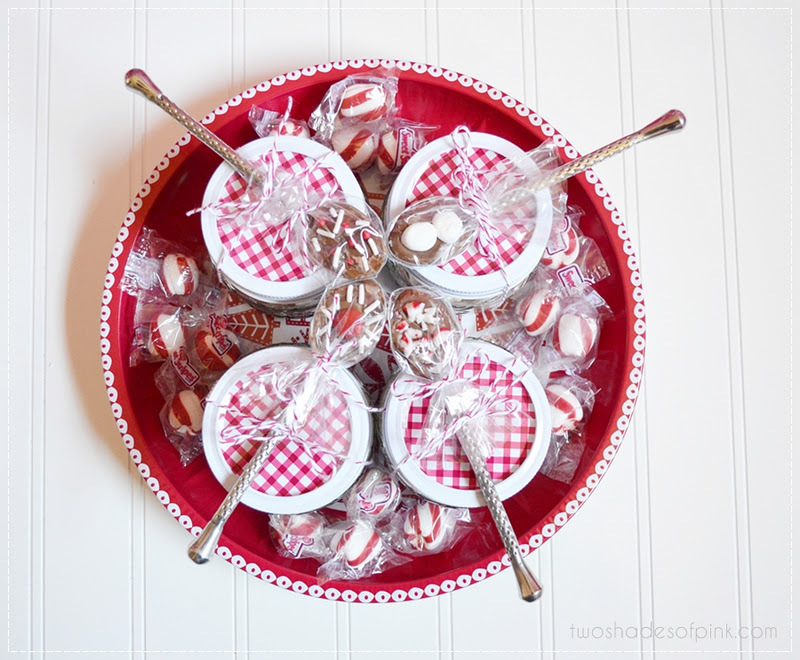 :) So when I happened upon these 1/2 pint cuties (at Wal Mart) with red and white gingham lids, I snatched them up to use for Christmas or Valentine's Day! Just adorable. This Christmas, I thought it would be so cute to make them into ready to serve hot chocolate drinks. I know this is not a new concept by any means but I really like the idea of them being all ready to go! 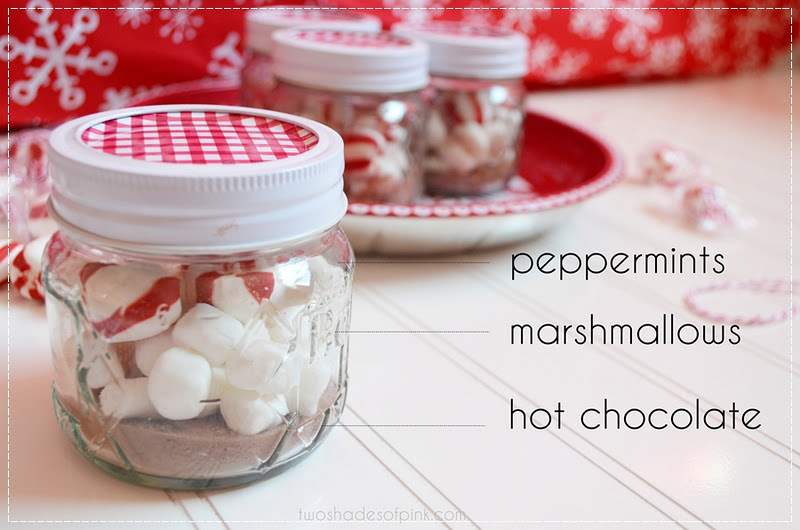 Just add hot water or milk and you are ready to enjoy your yummy drinkable treat! 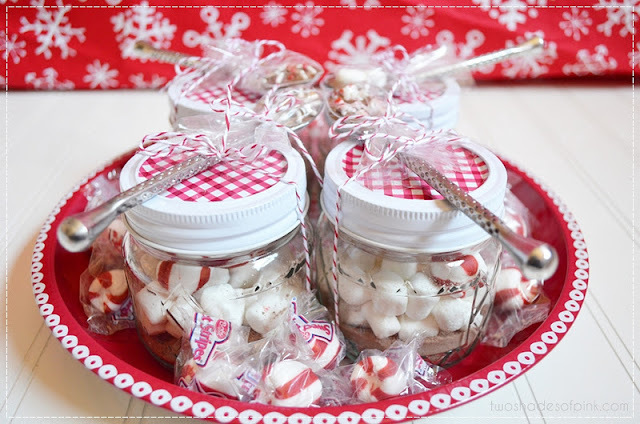 Just layer your goodies in your jar for a pretty presentation. 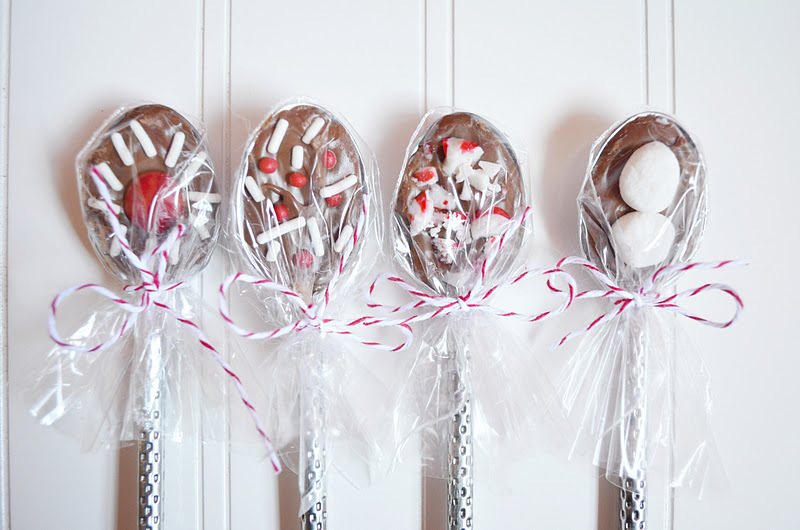 Now for the chocolate dipped spoons as an added treat. I bought these cute coffee spoons at Marshall's which are a perfect size because they are mini. I am really rocking the mini thing and loving it. 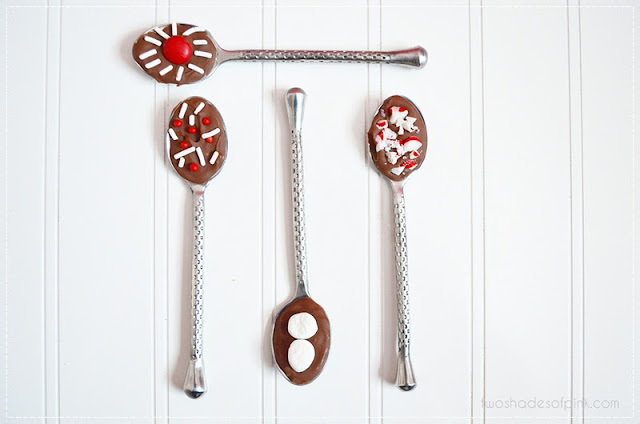 You can use plastic spoons (the red ones would look festive) or even hit thrift stores to find pretty vintage ones. I piped in the chocolate rather then dipping the spoons. Much neater! I melted the chocolate in a pyrex cup in the microwave. 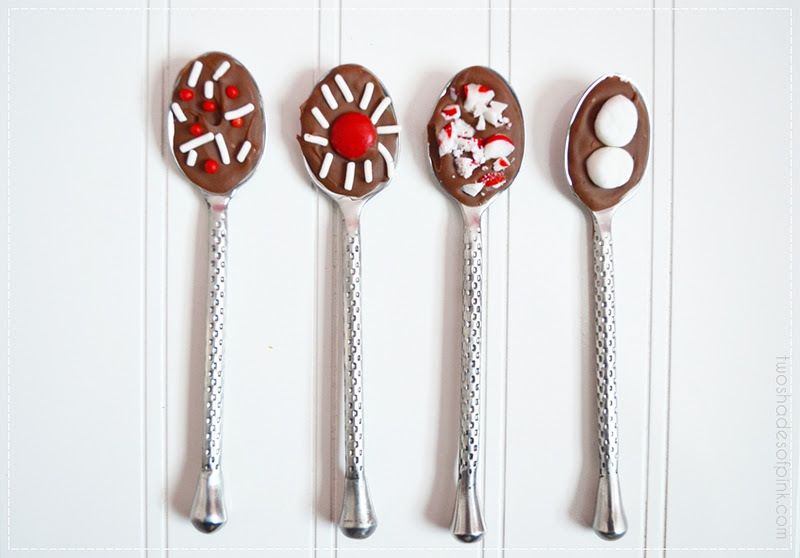 Using a baggie, I snipped the corner and piped the chocolate into each spoon. I used sprinkles, a red m & m, a mini marshmallow cut in half, and crushed candy cane to embellish these. I popped them in the fridge until set. 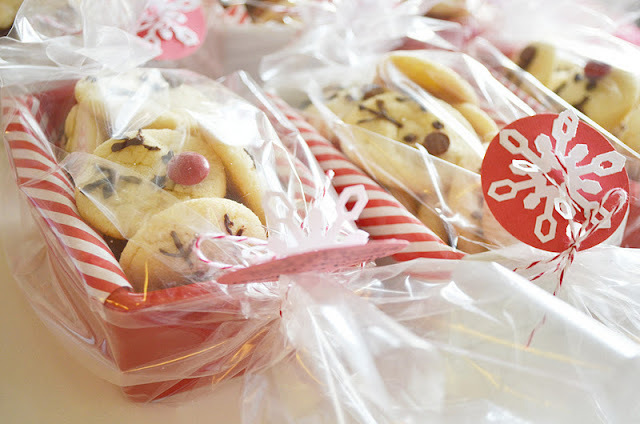 To package them, I used candy bags and cut them to size and tied them off with baker's twine. 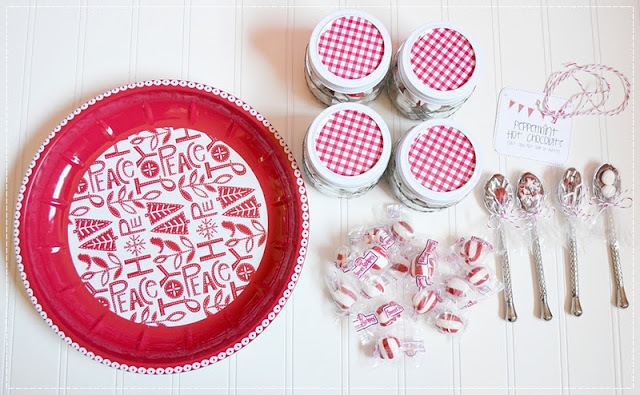 Now just put it all on your tray and wrap them with a festive tag and you have yourself an amazing gift or party favor. I had hoped to have a printable tag for you but there were some kinks in the process and then time got away from me. But if I end up making one I will let you know and post it back on this post for you to download. But I can't make a promise! It's a crazy time of year! So do you like the little spin on this fun little giftable treat? 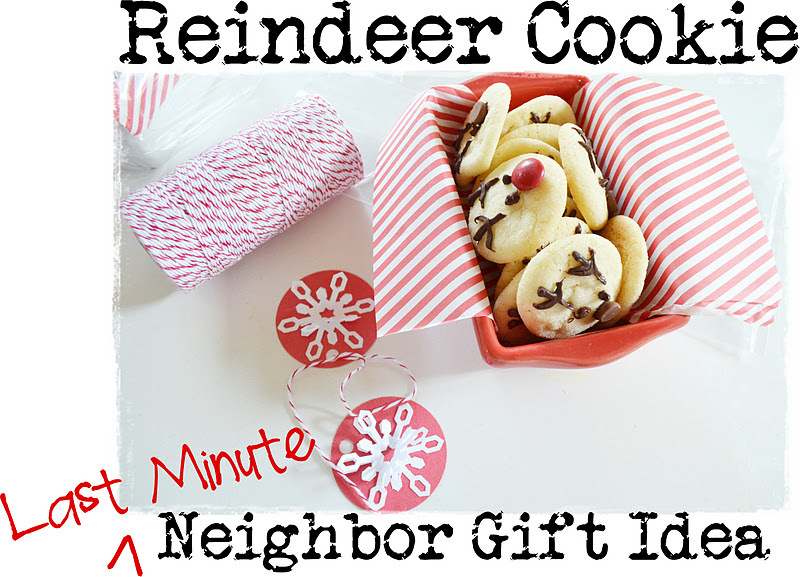 What are you all making for your neighbors or teachers? I can't believe this is the last week of school before Christmas break...I need to get moving so I would love to hear your ideas. I have an idea that I will share hopefully later this week. Hello again lovelies! How I have missed you! I've been behind the scenes crafting but have had zero time to photograph or do a lot of tutorials. I sure do miss it! Good lighting during the day is hard to come by so my chances for quality photography are pretty limited. But I put together some more packaging ideas here and there and did little mini shoots for you with some gift wrap inspiration. Today I am focusing on tying up those packages. What is it about embellishing that makes wrapping so fun? The delicious anticipation of what hides inside a package is glorious enough! 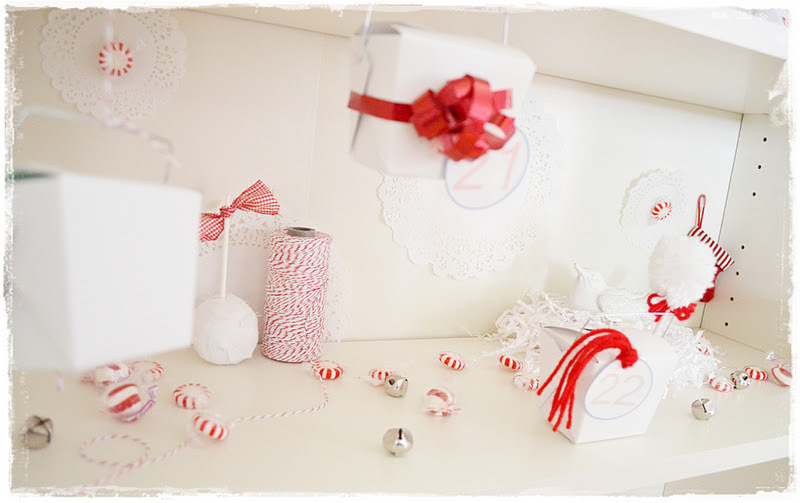 Yet the extra prettiness of ribbons and bows make it even more delightful. So I fiddled around with some ideas to see what I could come up with. 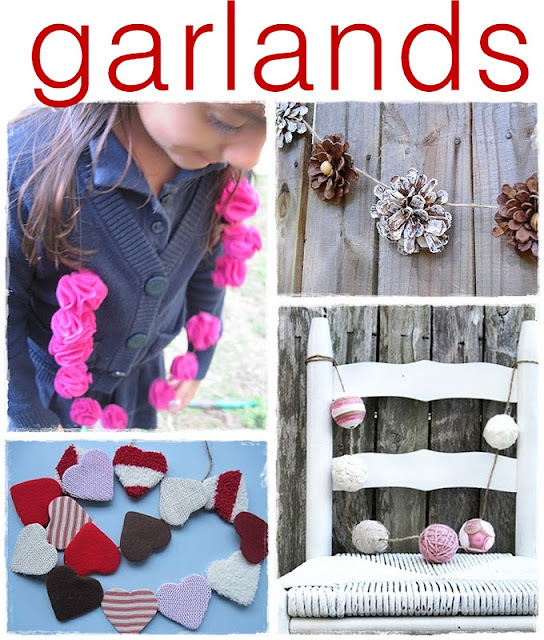 Top Left: Oh yes...you knew I would have pom poms. Their whimsy and playful cutness are too wonderful to pass up. I loved making those pretty teal-ish, aqua-ish (what color is that?) 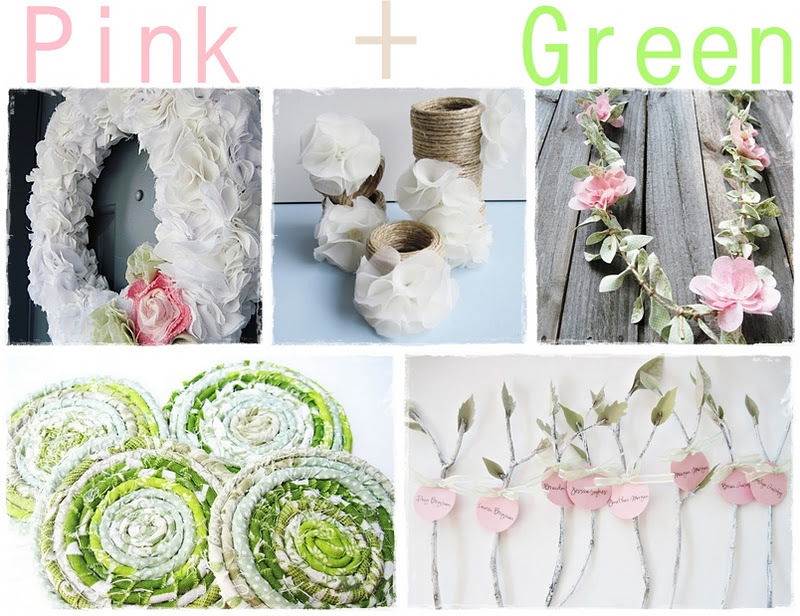 for this tie that could also be a garland. 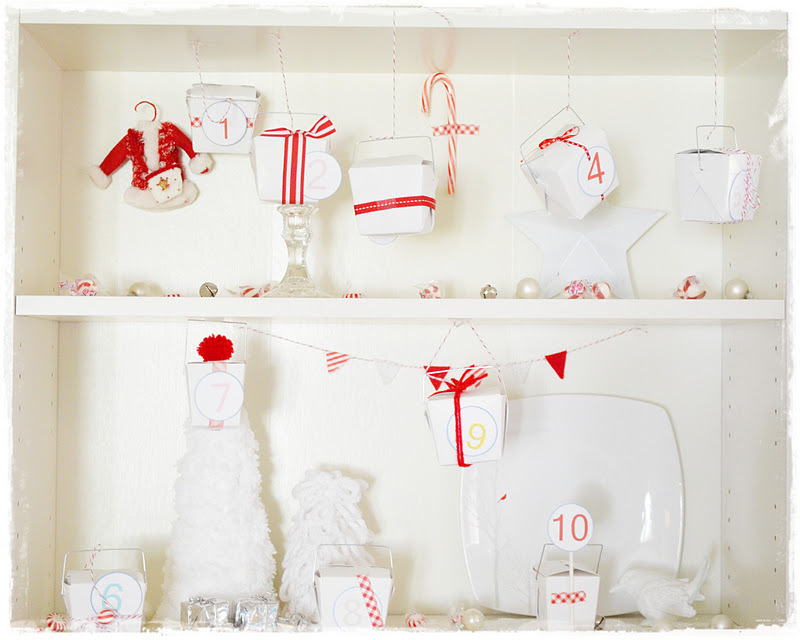 The little white ones are store bought by the package and simply threaded with a needle onto baker's twine. 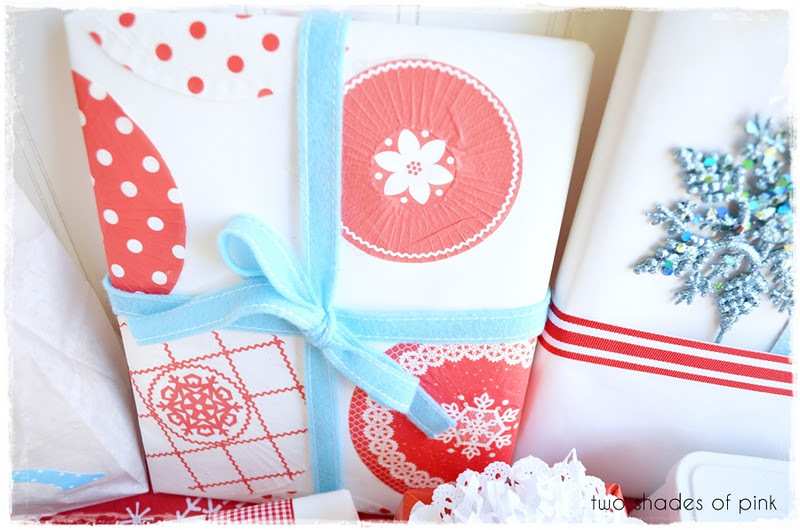 Top Right: Red and white bakers twine and some jingle bells. Simple. Perfect. Bottom Left: This is simple grey thread and sequins. 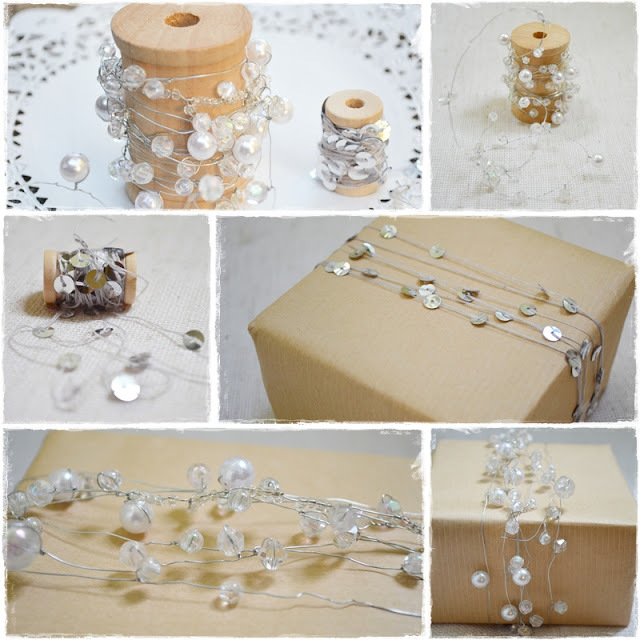 Add a little sparkle goodness with a pinch of simplicity. 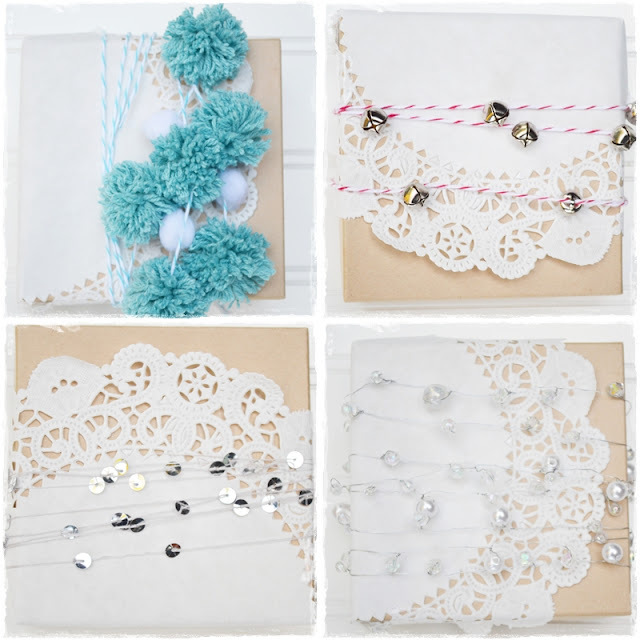 Bottom Right: How about using paddle wire with some pretty beads and pearls? I simply slid some wire through the bead and twisted it to stay put. Pretty, pretty. Some cute but earthy tags made of clay and wood. I am a total novice with polymer clay but experimented with food coloring to dye it (too lazy to go out and buy the different colors) and alpha stamps. I made some mistakes but I like the imperfect feel of them. 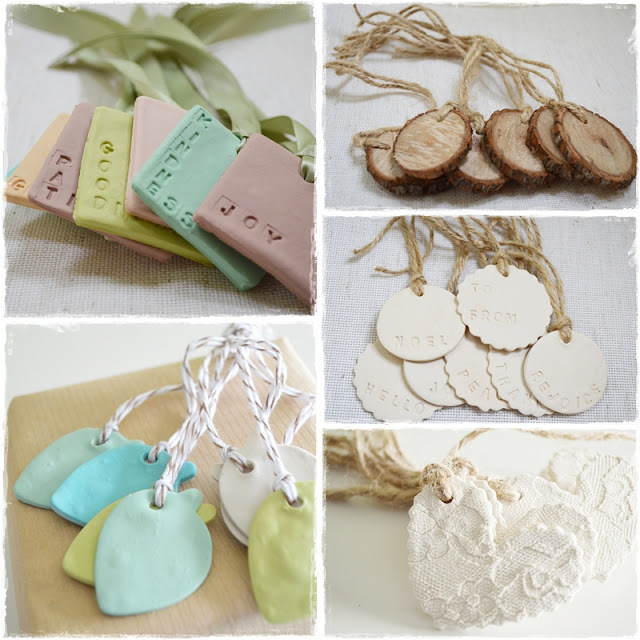 Clockwise from left: Fruit of the Spirit tags (love, joy, peace patience...from Galatians 5:22-23), wood circle tags and twine, scallop and circle tags with stamped words, clay hearts and twine with lace imprint, and clay leaves in cool blues and greens with bakers twine. Tonight I am decorating a table at church for a Women's Ministry Christmas Tea Saturday morning! Oh y'all know how I like a good tablescape! But I confess to winging this one and kind of pulling something together last minute. It is definitely not my usual (it's all about the details) approach but I hope to pull it off. I have spray painted, cut, tied, and glued stuff. And shopped my house once again. All in the last 2 days and throughout the process wondering when my procrastinating self will become proactive. I have no idea what it will look like but I promise to share it with you. Success or fail! And I have more Christmas goodies up my sleeve too.